After getting over jet lag and waiting for a nice day, we spent a lovely afternoon at Bodiam Castle, East Sussex. Ella, Kate and Caitlin (their cousin), had great fun climbing up the towers and over the ruins inside. Mum and I didn't do so much climbing but enjoyed it just the same! A few days later we had a family day out in London; went on an open top bus tour, then a river cruise and finally a ride on the London Eye. It was a beautiful summers day and the view from the top was amazing. We finished off with a stroll from Trafalgar Square down The Mall to Buckingham Palace - very touristy but great fun! Family day trip to London! I am so happy to see your blog and to know whats happening as you and the girls are often in my mind. All the best for the clinic treatment - you should just come here to Vietnam as it's always so darned hot I am always dripping. If only I could give you some of my health, I would. The girls have grown so much I cant believe it and Kate has her Dad's big smile. Gorgeous girls and you must be very proud of them. Fantastic photos Linda, can't believe how big Trudi's are! Well done for getting your blog up and running. Hope the treatment is going well, you should enjoy being warmed up a bit!! Thinking of you & my friend Jo was asking after you today. Oops meant to say Trudi's girls! Should give you a laugh anyway. 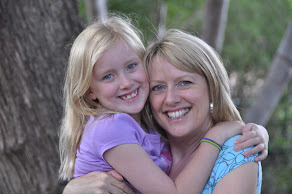 Glad to see your blog is up and running - great pics of you and the girls and so pleased you are enjoying warm weather! Thinking of you loads and hoping the treatment goes gently for you. Look forward to seeing more of the local photos when you get a chance to update the blog. Take care. Good luck with the treatment - I hope it all goes extremely well. Enjoy Jo's visit - wish I was visiting you too. Just got back from dorset camping with the kids and mick and have had a sunny time for a change - it always pours when we camp! Thinking of you and hoping that the treatment brings you what you want and its not too onerous. Thanks for the blog and the great photos. Good luck with the treatment. Hey linda I have some dear friends that I think live close to where this clinic is. I will email them about your next visit. They have two girls, 16 and 12. We met them when we lived in NJ. Lily and their oldest were born around the same time and we have kept in touch on and off through the years.We just spent a week with them in Maine this summer. I will let you know what I find out. I hope the treatments are helping. Thanks for the updates.